LEVEL ZERO – The Movie from Thaddeus @Setla on Vimeo. Yesterday marked the four year anniversary of this blog, and what a ride it has been, and sitting here in a completely different system in a different state with different friends and colleagues around me, I cannot help but reflect back at how crazy this journey has been. For me it all started with a trip to California provided to me by AMR, and a few conversations out there with a few paramedics about a little movie called Level Zero that I had stumbled across on the internet. For those of you who have read through the posts of this blog, you know where it went from there. I started writing. I connected with Ted Setla and Justin Schorr. 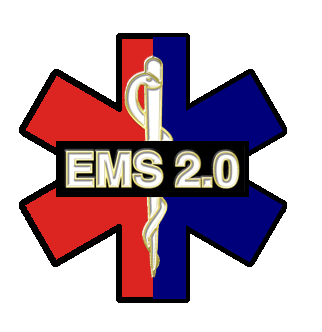 The EMS 2.0 logo and pin were created. I came out of my shell and found a love for teaching and now, four years later, I am still at it. The road has not been without bumps, and times have not always been easy but ultimately I could not be happier about where I landed. I wonder sometimes what i would be doing had Mike Taigman not reached out to the east coast for help, or had I not gotten a ride down to one of the southern hospitals in the county from one of their Clinical Specialists. Any little turn in that road could have changed everything. I was lucky though. I have come out of this four year rollercoaster with some great friends who I would not trade for anything. I have had a little hand in sparking change in my old system in Springfield, and still love following their accomplishments even now, over a year after I left. I’ve sung Karaoke with people from EMS World and EMS Today. I’ve sat down and interviewed a man who someday I hope to have a shred of his ability to lead. Justin Schorr’s number is in my phone, although I don’t talk to him nearly as much as I’d like. I’ve lobbied on Capitol Hill. I’ve hosted a podcast that I used to listen to and wish that maybe someday I would have a shred of the ability that Chris Montera does. I’ve grown as a clinical provider and a person, all thanks to this wild ride that I have been on. Now here I am, a little over a year into my new system and I really feel like I have found my fit, so rest assured to those of you who actually are faithful readers this blog is not going anywhere. There are plenty more stories to tell. Thanks to everyone for reading! Let’s make this next year a great one! New thinking, new ideas, same old field!